The eastern corridor of Mumbai – especially the suburbs from Ghatkopar to Mulund and Thane – has been witnessing a major transformation over recent years. From being a largely industrial belt to developing into a hub for malls and premium residential towers replete with the latest amenities, the area has undergone tremendous transformation. 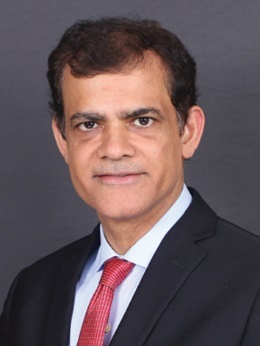 Infrastructure projects have always had several positive implications for Mumbai’s real estate market, and what these suburbs are witnessing now is predominantly the impact of a significantly improved infrastructure scenario. Proximity to the de-facto CBD of Mumbai, i.e. the Bandra-Kurla Complex (BKC), and connectivity to it via the Eastern Express Highway are now major advantages. LBS Marg is another road through this part of the city which is now a destination of many office, retail and residential developments. To reach the central business district, residents can get onto the Eastern Freeway and save many precious man-hours annually. The Eastern suburbs now also benefit from proximity and good connectivity to the emerging business district of Navi Mumbai. Powai is another very important residential-commercial hub of Mumbai, adjacent to both Vikhroli and Kanjurmarg. These suburbs also have an important link to the city’s airport and western suburbs – the Jogeshwari-Vikhroli Link Road (JVLR), which connects the Eastern and Western Express highways via Powai and Andheri. Moreover, the only metro of Mumbai connects Ghatkopar to Andheri, and the upcoming metro routes will mean better connectivity to these areas. Job creation as a residential market driver is a powerful force in a city like Mumbai, and these suburbs have had more than a fair share of it. The demand for residential properties in the city, regardless of locality, results from an area’s ability to generate employment and also accommodate the resulting residential demand. Many office occupiers in Powai, Kanjurmarg, Vikhroli and Thane are better able to provide their employees with the ‘walk-to-work’ concept, thanks to a good mix of commercial and residential properties. Ghatkopar and Mulund naturally get the benefits too. While lower rentals and larger floor-plates available here attract office occupiers, better affordability offered to home buyers in these suburbs when compared to some of their western counterparts is further driving residential demand. Availability of land and defunct mills now getting transformed into residential developments are going to be important market drivers here in the years to come. 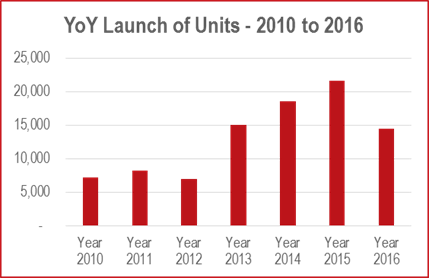 A look at the number of units launched from 2010 to 2015 reaffirms the trend. Except for the year 2012, the y-o-y growth between 2010 and 2015 in East Mumbai has been phenomenal. Although 2016 witnessed a decline in new units launched compared to previous years because of the post-demonetisation slowdown, the demand-supply dynamics will improve in times to come. The social infrastructure in East Mumbai has improved perceptibly over the years, with prominent malls, multiplexes and high streets as well as schools, colleges and hospitals coming up in these precincts. And this has also led to increase in capital values - from being INR 9,400/sq.ft. 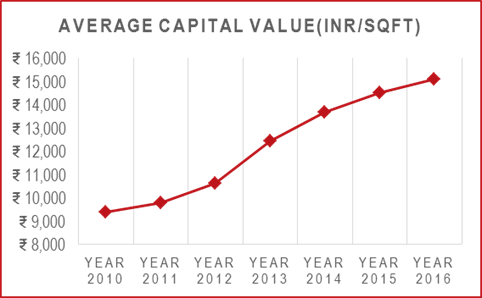 in 2010, the average prices rose to INR 15,113/sq.ft. in 2016. Moreover, there is still room for good growth in the coming years. Although the western region of Mumbai boasted of more significant infrastructure and real estate development until a few years ago, the Eastern Suburbs now stand to benefit as well, as they would enjoy easier connectivity to the Southern and Western parts of the city on the back of the upcoming infrastructure projects. Considering the overall real estate trends in Mumbai and factoring in affordability, physical and social infrastructure and connectivity, the Eastern Suburbs promise to continue providing residential options that are more affordable to buyers wanting to live within city limits.